Silver-grey back with pink head and underparts. Short grey legs and pale pink crown are similar in both sexes. Male's iris is brown; female's is red. Found in Australia except in the extreme southwest and parts of Tasmania. Prefers open grasslands and savannah woodlands. Diet Seeds, grains and bulbous roots. Reproduction Most nesting takes place from August to November. Pairs separate off from larger group during breeding season. Male and female prepare nest in hollow tree hole lined with leafy eucalypt twigs. The birds strip the bark surrounding the nest's entrance. Female lays 2 to 6 white oval eggs. »» The galah is a fast flier and is often seen performing aerial acrobatics in flocks of up to 1,000 birds. »» The galah often remains with the same mate for life. »» A young galah can fly as well as an adult; however, it tends to have crash landings. »» The survival rate among new fledglings is very low. Only 10 out of 100 survive through their first winter. However, those that do survive usually live a long life. »» Parents continue to feed their young for 6 to 8 weeks. While the parents are foraging for food, the young gather together in nearby woodland areas. The young can identify their parent's returning call and will fly back to the nest to be fed. 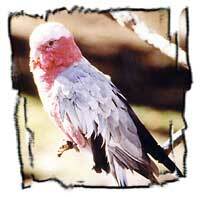 »» The galah is considered a pest to local farmers because of the crop damage the bird often causes.